Augmentin is an antibiotic that belongs to a group of drugs called penicillins. It contains a combination of amoxicillin and clavulanate potassium. Amoxicillin fight all the bacteria present in the body. Whereas, clavulanate potassium is a beta-lactamase inhibitor that helps in preventing certain bacteria’s from getting resistant to amoxicillin. Apart from this, it is also used to treat many other infections caused due to bacteria, such as; pneumonia, sinusitis, urinary tract infection, etc. including infections of the skin. You can buy cheap Augmentin 250mg/125mg Online at unmatchable prices. 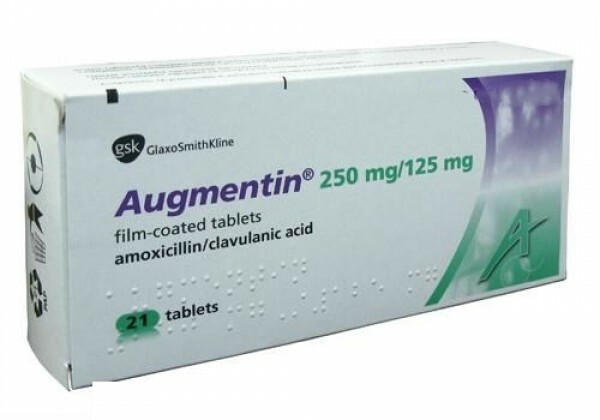 Do not use generic Augmentin 250mg/125mg if you are suffering from severe kidney disease, or if you have had liver problems or jaundice while taking this medication, or if you are allergic to any penicillin or cephalosporin antibiotic, such as; Amoxil, Ceftin, Cefzil, Moxatag, Omnicef, and many others. If you switch from one tablet form to another (chewable, regular or extended-release tablet), then it is advised to take that new tablet form and strength prescribed for you. This medicine may not be as successful or at the same time can be harmful if not taken in the correct form as prescribed. Do not use this medication if you are breast-feeding. Augmentin can make birth control pills less effective. Ask your doctor about using a non-hormone method of birth control (such as a condom, diaphragm, spermicide) to prevent pregnancy while taking Augmentin. • severe skin reaction - fever, sore throat, swelling in your face or tongue, burning in your eyes, skin pain followed by a red or purple skin rash that spreads (especially in the face or upper body) and causes blistering and peeling. Take this medication as prescribed by your doctor. It is not recommended to take this medication in larger or smaller amounts or for a prolonged period of time. Take Augmentin every 12 hours, at the start of a meal to avoid your stomach from being upset. Do not chew, swallow it whole or break the pill in half and take it one by one. The chewable title must be chewed before you swallow it. Shake the liquid medicine well before measuring it. Use the medicine till the time it prescribed to you. Your symptoms may improve before the infection is completely cleared. Do not skip your dose as it may increase the risk of further infections. This medicine can cause unusual results with certain lab tests for glucose (sugar) in the urine. Inform your doctor that you are using Augmentin. I made the payment for my order via echeck, it is very fast and effective payment method, thanks so much.